A busy day Thursday with 6 plays going 4-2. Yes, things are indeed picking up here at RickJ's!!! A busy day Thursday with 6 plays going 4-2. Yes, things are indeed picking up here at RickJ’s!!! Betting is 70% on the road favorite with the line moving from -7.5 to -7-102. Models favor Memphis, Variables are neutral and Public betting strongly favors Cincinnati with a reverse line move off of a 30% game. Here we have the models disagreeing with the public and no variables to speak of to give us a clue. An easy pass for me on this one. 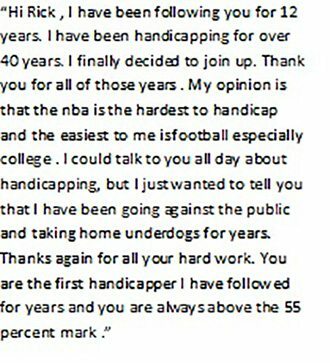 Betting is 60 % on the road dog with the line moving from -27-106 to -28.5-110. Models favor UNLV, Variables are mixed on the game. However one of the strongest variable I look at points to UNLV. Saying that there are several others that point to Boise but not near as strong. Finally public betting favors Boise with 40% on the home favorite and a reverse line move. So a mixed bag of clues. I was looking for any excuse to bet on UNLV with one of the top variables pointing that way. But even with that there is not enough to convince me to bet the game. A pass for me on this game also. We had six one unit plays on Thursday going 4-2. 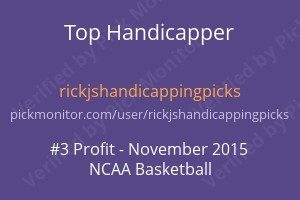 In college hoops, we had 4 totals with Marquette, SMU and Villanova under all winning and Davidson Under losing. In the NBA we had a rare total which was an easy winner with Minn Under 211 and finally in the NHL we had Arizona +125 that lost 2-3 in OT. So far today I have sent out 1 one unit play and we have a carryover into Sunday with a 1 unit play. Things are picking up to say the least and it will be this way for almost a month until we get into conference play. Then Hoops will settle down a bit. This was the time the last two years that we put up incredible numbers. Let us see if we can continue this in 2016. So, fellow geeks who are in their 20s and 30s are interested in learning what to expect as they get a bit older. I have hesitated to mention this but I am putting it into consideration as the number of emails from followers regarding this has grown substantially recently. I will give some thought to figuring out how to approach it and mention this in a few weeks. For those of you wanting or thinking about joining our group all you need to do is click on the drop down menu under PayPal on the upper right and pick the subscription of your choice. All have a 3-day free trial. Or you can just follow @rick_sports and send me an email asking for a 3-day free trial. Either way is fine. That is my private twitter feed that I use along with a backup SMS for sending out plays.